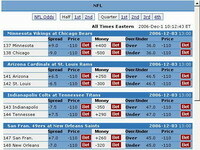 Software: Interchamps Sportsbook utilizes Futurebet software. Navigation through the site was relatively easy. The pages were quite simplistic, without too much information on them. There was almost no news or statistics to be found anywhere (some people like this whereas others do not). I found that there was lag (pages were quite slow to load) on many of the pages that I was trying to view (NOT during peak hours.) The help menu has a lot of useful information for novice users. To qualify for the 20% bonus, the player must deposit a minimum of $250. All deposits below $250 qualify for a 10% bonus. Bonus money is credited to your Free Money account. All bonus money is released and can be withdrawn once a ten (10) times deposit plus bonus rollover is met. If a withdrawal is made before the bonus terms are met, bonus funds including money earned by wagering the bonus will be forfeited. 20% Sign Up Bonus is not applicable to people residing in Denmark, Russia, Norway, Thailand, Finland, Indonesia, Ukraine and Israel. Wagers placed on Roulette, Craps or SicBo are excluded. The referral bonus will be applied to your account once your referred person makes a deposit. Just send an email to customer support with your and your friend’s full names and usernames, and Interchamps will give you $50 or 5% (whichever is lower) of his/her initial deposit. To cash out the referral bonus money you must wager a minimum of three times the bonus amount. Refer a Friend Bonus is not applicable to people living in the same household. Anyone who opens an account and deposits any amount is automatically entered into a draw to win Interchamps Extrava-Gifts. Prize will include air fare, accommodations and tickets to the event if applicable. Winners names will be posted on the website, and they will be contacted by Interchamps promotions department. There were not many withdrawal options to choose from and the prices for FedEX cashouts are quite high ($5 for checks and $50 for Fedex) . There is a $4,000 maximum weekly cashout limit. Any amount greater than $4000 is divided (no part can be larger than $4000) and sent on consecutive weeks until the total amount has been delivered. Cashout speed: My NETeller cashouts took 5 days! Support: Customer care representatives are available 24/7. Toll free telephone number, e-mail support and live-chat are available. I was on hold for a few minutes before the toll-free number was answered. Support staff was not very knowledgeable and was only able to answer some of my questions over the telephone. The FAQ page does not have very much useful information.